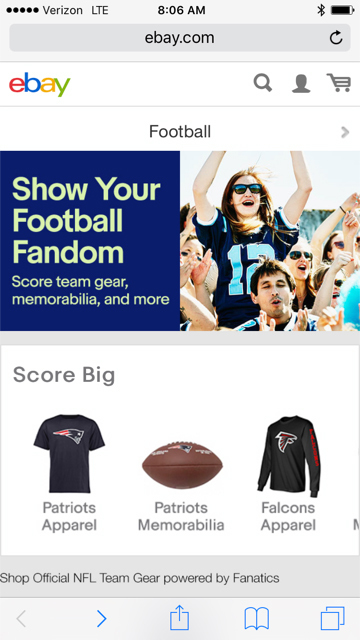 With NFL fans gearing up for Super Bowl LI, eBay DataLabs has been analyzing troves of customer behavioral data pertaining to top-selling team and player merchandise. 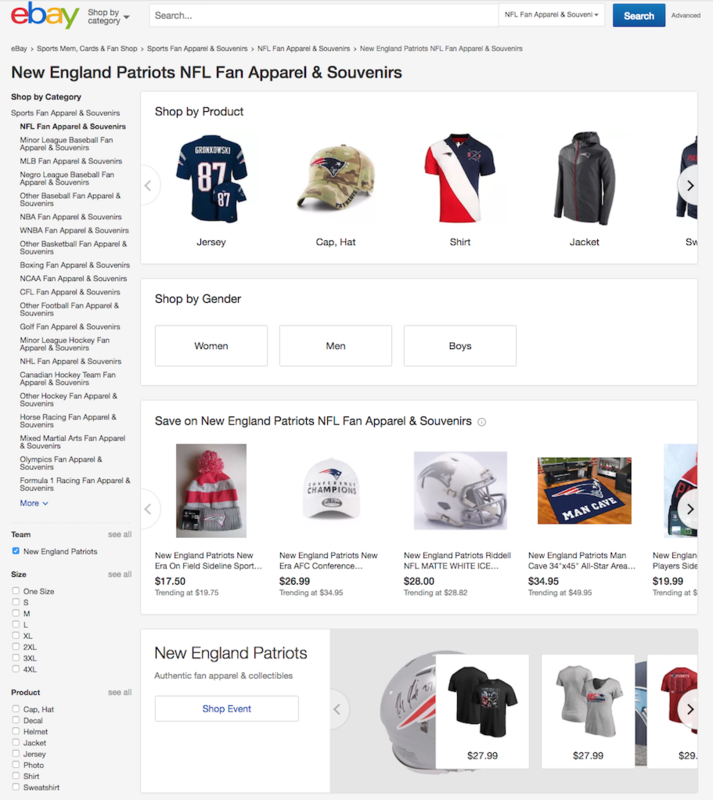 In time for the big game, eBay has also made it easier to find and purchase all the merchandise that you could ever want with Cross-Category Browse. In between stocking up for gameday, be sure to check out some of our fun facts based on eBay’s data (click here to see last year’s data.) Here are some interesting facts on eBay ahead of the big game. In terms of team item sales in the United States on ebay.com since January 2015, the New England Patriots have been among the most commercially influential teams in sports. Across all US teams in all sports, the Pats rank 6th in US sales in between the Pittsburgh Steelers (#5) and Boston Red Sox (#7). The Atlanta Falcons (#47) rank further down the list, right behind collegiate powerhouse Ohio State (#46). The Patriots reach extends far beyond New England. When analyzing head-to-head in sales with the Falcons, the Patriots sell more items in every state – except Georgia and Alabama. On the other side, Brady’s home state of California is 3:1 for Patriots. Brady’s college state, Michigan, is 4:1 for Patriots. And Massachusetts is 41:1 for Patriots. Who Most Depends on Bay State and Peach State Fans? The sports markets in Massachusetts and Georgia are poles apart. Among the top 100 teams ranked by sales since 2015 on eBay.com, the table below shows the five teams that take the highest percentage of sales from those two states. For example, three NCAA teams rely on Georgians for commercial support. The Georgia Bulldogs get half of their sales from Georgia. 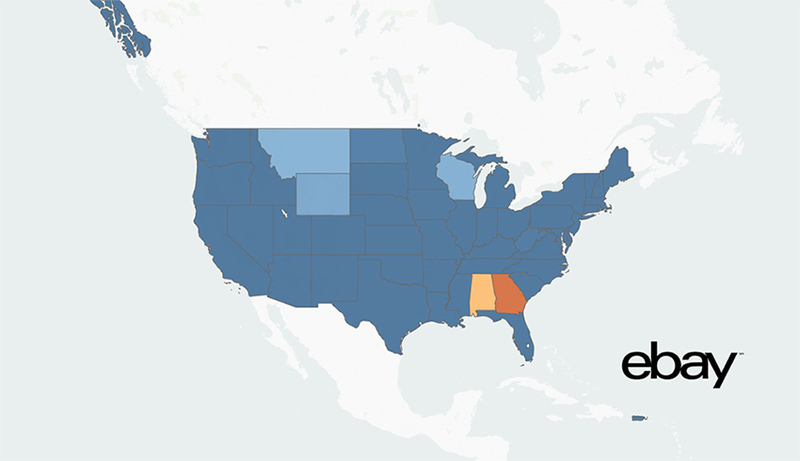 Georgia neighbors Alabama Crimson Tide and Florida Gators also depend on Peach State fans – Georgia produces 10% of sales for each team. Up north, the Boston Bruins take 30% of their sales from Massachusetts – the highest percentage of any team. Whereas teams with larger national fandoms, like the Patriots and Red Sox, take much less: 17.4% and 14.0% respectively. What if we used this view of fandoms to shade the state map? In the map below, California is shaded a neutral white. Why? Because even though the Patriots sold more in absolute terms, both the Patriots and Falcons got 7.9% of their total sales from the state of California. An equal number. Hence the neutral shade. Accordingly, red shade signals states like Upper Midwest markets Montana, Wyoming, North Dakota, Minnesota, Wisconsin, Iowa where the Falcons drew a higher percentage of total sales than the Patriots. By contrast, blue shade signals states where Patriots drew higher percentages of their national sales: New England of course. Also New York, Michigan, Florida, Texas, Nevada. Tom Brady, two-time MVP who helped lead the New England Patriots to three Super Bowl championships, will be matched up against four-time Pro Bowler and Super Bowl newbie Matt Ryan of the Falcons. Not surprisingly, eBay data shows that Brady is the most popular New England Patriots player with 16,411 pieces of fan merchandise sold on eBay’s marketplace throughout the course of this season, followed by not even a close second tight end Rob Gronkowski with 5,135 items sold. Notably, wide receiver Julio Jones is the most popular Atlanta Falcons player with 2,633 pieces of fan merchandise sold on eBay this season, followed closely by quarterback Matt Ryan with 2,323 items sold. Taking a nine-year look back at jersey sales, Peyton Manning’s jersey in 2014 earns the crown for the most popular jersey among Super Bowl players. Still, Brady and Ryan are receiving plenty of love on eBay leading up to Super Bowl Sunday. Predicting the Outcome of the Big Game? Some Signals. If you look at buyer behavior since the Super Bowl seeds were clinched (January 21 – 24), Atlanta Falcons fans are showing their pride with high hopes their team is going to come out victorious, according to eBay DataLabs. Atlanta Falcons fan merchandise sold 1 second more frequently than New England Patriots fan merchandise. 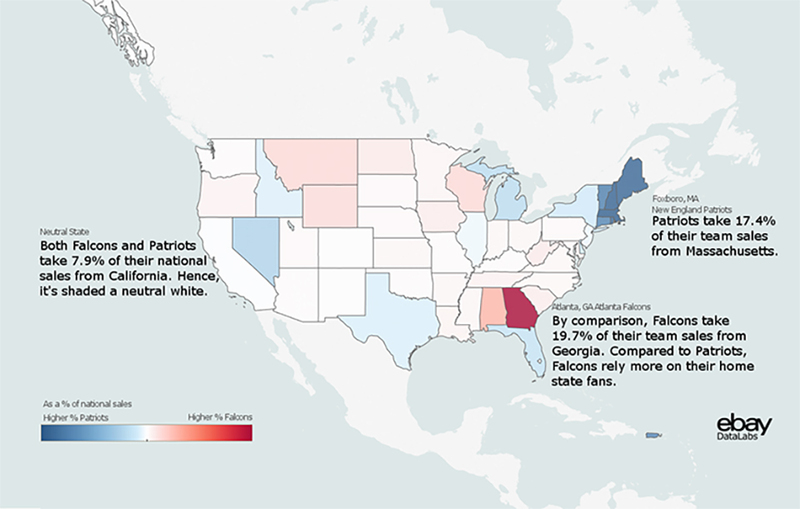 Atlanta Falcons fans purchased more team merchandise by quantity than New England Patriots fans. But, if you looked at buyer behavior over the course of the entire 2016 NFL season, the New England Patriots come out on top. New England Patriots fans have purchased 3x more team merchandise (both by sales & items bought) than Atlanta Falcons fans since the start of the NFL season. 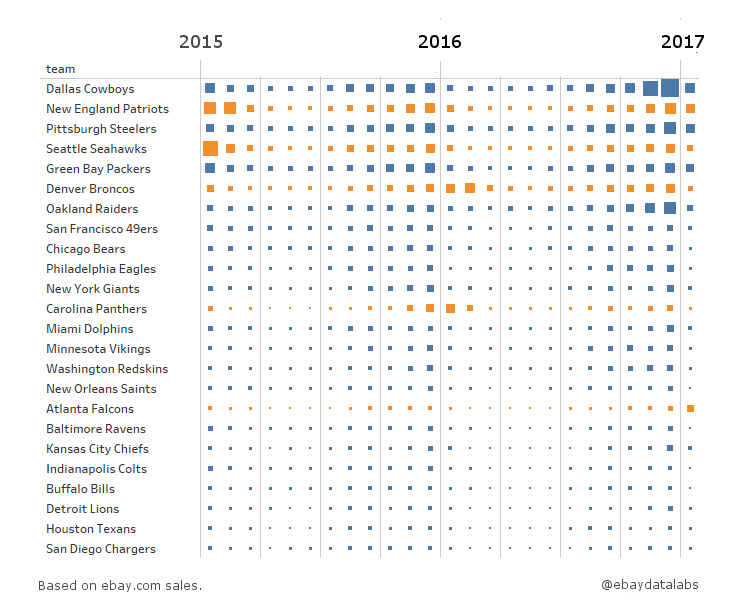 Here’s how the past few years looked in terms of sales among Super Bowl teams (colored orange in the table below) in comparison with non-Super Bowl teams (colored blue). Sorted by item sales after the last three Super Bowls, see how the Atlanta Falcons compare as a smaller market team and how January 2017 item sales #RiseUp compared to previous champions. Will the recent enthusiasm of Atlanta fans translate to a win for the Falcons? We will have to see, but last year’s map from @ebaydatalabs showed Denver’s national sales force before kickoff. Ready to Show Your Spirit? There’s still time to show your team spirit, even if you have to wait until August to see your team play again. Get fired up and show where your allegiance lies. Visit http://www.ebay.com/rpp/football to buy gear from your favorite teams.